Vertigo is that sensation where everything around you is spinning, or you feel dizzy. Although there is no movement at all, you will feel off-balance or unsteady. Vertigo is most often brought on from changing the position of your head. For some, vertigo occurs just once, but for others, it will continue happening until the underlying cause is found. Underlying causes that contribute to vertigo include labyrinthitis, Meniere’s disease, and benign paroxysmal positional vertigo (BPPV). Treatment for vertigo will often depend on the cause of the condition. In this article, we will explore some natural vertigo treatments, including dietary changes, home remedies, supplements, and homeopathic remedies. Luckily, appropriate lifestyle changes and natural vertigo treatments may improve your symptoms. A good place to start is your diet. What are some good strategies for an anti-vertigo diet? High cholesterol can sometimes lead to vertigo and dizziness caused by poor circulation in the body. You can easily balance cholesterol levels with a high-fiber diet by including a variety of fruits, vegetables, and legumes. Some great choices include raspberries, strawberries, broccoli, cabbage, spinach, lentils, pinto beans, and black beans. Essential fatty acids also protect the heart. Good sources include flaxseeds and fatty fish like salmon or mackerel. High blood pressure and atherosclerosis are possible vertigo causes as well. As a result, necessary dietary changes can help combat it at the source. The Dietary Approaches to Stop Hypertension (DASH) diet is often prescribed for high blood pressure. The diet consists of high amounts of vegetables and fruits, low-fat dairy, and whole grains. The DASH method is low in saturated fat and cholesterol, and high in fiber, protein, calcium, potassium, and magnesium. Diabetes is another possible cause of vertigo. Low glycemic (GI) foods can help regulate blood sugar levels. Low GI foods will raise blood sugar levels slowly, and include foods with a GI of 55 or less. Some nutrient-dense, low-GI foods are artichokes, zucchini, cabbage, okra, radishes, broccoli, eggplant, watercress, lettuce, asparagus, celery, and turnip greens. Vertigo is thought to be a symptom of magnesium deficiency. Magnesium-rich foods in an anti-vertigo diet should include quinoa, buckwheat, ginger, salmon, basil, collard greens, beets, tomatoes, sunflower seeds, kale, and tofu. Vertigo may also be due to a vitamin D deficiency. One 2014 study even suggests that low levels of vitamin D can worsen symptoms in those with BPPV—the most common trigger of vertigo. The best food sources of vitamin D include eggs, shrimp, sardines, cod, tuna fish, mackerel, wild-caught fish, caviar, beef liver, cod liver oil, and mushrooms. If your diet contains many processed foods, it is likely also high in sodium. Sodium can disrupt fluid regulation and balance in the body, leading to vertigo symptoms. A nutritious anti-vertigo diet with natural foods will provide sufficient sodium for a healthy adult. Avoid processed snack foods, frozen dinners, and canned products. High-sugar products will also upset fluid balance that may trigger vertigo. Consume a whole-food diet with plenty of fruits and vegetables. Avoid processed sugary foods like soft drinks, cereals, baked goods, pancake syrup, and jam. The amino acid tyramine can trigger migraine headaches. It is best to avoid tyramine-rich foods. These include aged meats like smoked sausage, liverwurst, salami, and pepperoni, and aged cheeses like provolone, brie, cheddar, Roquefort, blue, Swiss, and mozzarella. Other high-tyramine foods include figs, bananas, chocolate, and yogurt, as well as nuts and seeds. As a result, to avoid vertigo, it is best to avoid pecans, peanuts, peanut butter, pumpkin seeds, sesame seeds, walnuts, and other nut and seed butters. Beyond the normal dizziness you feel when drinking, alcohol can also change the composition of the fluid in your inner ear. Alcohol and caffeine can also lead to dehydration, and this can cause dizziness and changes in blood pressure that make us feel off-balance. Dizziness is another known side effect of caffeine overdose. Caffeine and alcohol also have a negative effect on the circulatory system. Limiting your alcohol and caffeine consumption, or even stopping altogether, can help improve your vertigo symptoms. There are plenty of other natural strategies for vertigo treatment at home. A great natural remedy for vertigo includes regular intake of water. It is best to keep well hydrated with 10 8-oz glasses of filtered water. Add a pinch of salt, black pepper, and juice from half an organic lemon to a glass of lukewarm water to make lemon water, which is known to reduce feelings of dizziness. People who don’t get enough sleep may also experience vertigo. That is why it is necessary to make it a priority to get seven to eight hours of sleep each night. This will give you energy for the day ahead. It is also wise to be consistent with your sleep habits and avoid napping during the day so you sleep well at night. For reducing dizziness when you wake up, get up slowly when getting out of bed and do not walk too far in the dark. You may also want to sit on your bed for a minute so your ears and head get accustomed to a new position. An uncomfortable and flattened pillow may be pinching a nerve, and causing you to lose sleep. As a result, you feel dizzy after you wake up. In general, it is a good idea to change your pillow every six months to help improve neck posture while sleeping. Also, for reducing dizziness when you wake up, sleep with your head slightly raised on two pillows or more. A simple massage can help calm vertigo and improve blood circulation. Use relaxing essential oils such as lavender, chamomile, peppermint, lemon, and ylang ylang. When sitting upright on a chair, it is also a good idea to lower your head forward and touch your chin to your chest. Then slowly rotate your head clockwise three times. Repeat this counter clockwise three times. This can release spasms in your neck, and therefore reduce vertigo symptoms. When you manage stress, this can reduce the severity of vertigo. Stress impacts the immune system and increases the likelihood of suffering from swelling, ear infections, and other vestibular system-related problems. Good stress-reduction techniques include regular exercise, more sleep, meditation, deep breathing, yoga, tai chi, spending time in nature, and acupuncture. Acupressure is similar to acupuncture; however, you apply pressure with the hands rather than using needles. Acupressure can help manage vertigo through the stimulation of specific pressure points on the body. One common acupressure point is pericardium 6 (PC-6), which is located in between the two tendons below the wrist and on the inner forearm, about three fingers wide. Herbal remedies have long been used to treat vertigo, nausea, and dizziness. Some effective herbal supplements include ginger, wild indigo, cayenne, turmeric, butcher’s broom, and ginkgo biloba. In this section, we will take a closer look at some of the herbs mentioned above for vertigo. Ginger (Zingiber officinale) has long been considered effective for vertigo, dizziness, and nausea. The volatile oils and pungent phenol compounds, shogaols and gingerols, promote circulation and blood viscosity. This can improve blood supply in the brain and inner ear. The recommended dose of ginger is 30 drops to 90 drops of the tincture or two to four grams of fresh ginger root, both taken daily. Ginkgo biloba is known to improve neurological disorders, including the side effects of vertigo. It does this by improving circulation of the brain and inner ear. Research shows that Ginkgo biloba is as effective as a top medication for vertigo known as betahistine. Begin treatment with 250 milligrams (mg) of Ginkgo biloba capsules or tincture daily until the severity of vertigo is reduced, and then lower the dose to 40 mg to 60 mg for prevention purposes. Cayenne pepper (Capsicum annuum) contains the active compound known as capsaicin, and this decreases platelet aggregation and improves blood flow to the inner ear and brain. As a result, taking cayenne pepper may reduce the effects of vertigo. The recommended dosage of cayenne pepper is one 30-mg to 130-mg capsule, three times daily. Butcher’s broom (Ruscus aculeatus) is considered effective for vertigo since it improves circulation to the inner ear and brain while also offering vasodilator effects. The active compounds in butcher’s broom responsible for improved circulation are neoruscogenin and ruscogenin. For the best dosage of butcher’s broom for vertigo, consult your herbalist or natural health practitioner. Some other supplements used to reduce vertigo symptoms are vinpocetine, coenzyme Q10 (CoQ10), dimethylglycine, vitamin C with bioflavonoids, and vitamin B complex. Homeopathy can prevent the need to resort to drugs, and there are a variety of homeopathic remedies that can treat vertigo, regardless of the cause. A remedy correctly chosen by your homeopath will often safely and effectively treat symptoms. Research studies also support homeopathy for the condition. For instance, a popular homeopathic formula for vertigo called Vertigoheel features the homeopathic remedy Cocculus compositum, or cocculus. It is often recommended for vertigo in the forehead and has an association with tremors, faintness, numbness, nausea, weakness, and palpitations. A double-blind, randomized and controlled study published in the Journal of Alternative and Complementary Medicine in 2005, found that Vertigoheel improved atherosclerosis-related vertigo symptoms in 87 patients. In total, the study observed 170 patients between 60 and 80 years of age for six weeks. The researchers concluded that Vertigoheel is an effective vertigo alternative to another natural treatment, Ginkgo biloba, which was given to the other 83 patients in the study. Also, a four-trial meta-analysis also published in 2005 supports the tolerability and efficacy of Vertigoheel for vertigo patients. In total, the meta-analysis contained 1,388 patients. Two of the trials were randomized, double-blind controlled studies, and the other two were observational. The dosage and duration were also similar in all the trials. Researchers also compared Vertigoheel with the anti-vertigo drug betahistine, as well as other treatments such as Ginkgo biloba and dimenhydrinate. Besides cocculus (Indian cockle), there are several individualized homeopathic remedies prescribed for vertigo symptoms. The following are some of the homeopathic remedies a homeopath may recommend. Aconitum napellus is considered the best remedy when vertigo results from shock, head injury, fear, bleeding, or a fever. The sufferer may fall to the right, and experience faintness and vision loss. Symptoms may improve by breathing deeply or closing the eyes, but may worsen from urination, moving the eyes or head, and around midnight to 3:00 a.m.
Bryonia may be the best remedy when the sufferer feels like he or she is sinking into the bed. When they rise, they feel faint and dizzy; they need to lie down. They also feel bursting headaches, confusion, nausea in the chest, and the need to fall backward or forward. Walking and sitting will better the symptoms, but they may worsen from exposure to a warm room, raising the head, or any motion whatsoever. Calcarea carbonica is often required while the sufferer is walking, and it is accompanied by a dull head, heaviness, nausea, and vomiting. Patients typically also experience vertigo from looking up and sudden head turning. Individuals will also feel chilly and experience sour-smelling sweat around the feet, hands, and head. They are also considered the cautious type who doubts decisions. The symptoms will worsen from eyestrain, physical exertion, coldness, dampness, and the sun. Conium should be considered when symptoms include weakness, unsteadiness, and paralysis. The sufferer will experience vertigo when turning the eyes, shaking the head, turning over or lying down, or from the slightest noise. The person also has the tendency to fall to the left side. The remedy is also recommended when vertigo is related to older age, smoking, uterine disease, or sexual abstinence. Closing the eyes may improve symptoms, and symptoms may also worsen from alcohol and motion, or at night. The sufferer’s symptoms likely have an association with dim vision, fainting, falling, or the inability to think. The person feels that the room is spinning or turning, and they may experience vertigo symptoms after rising, eating, or upon waking. Symptoms will likely worsen from coffee, tobacco, or alcohol use; anger; bright lights; overeating; stress; mental exertion; or looking up or down. Petroleum is recommended when the sufferer feels like they are seasick or intoxicated. They feel vertigo in the back of the head, and nausea, numbness, and stiffness are also present. Lying down with the head held high may improve symptoms, but they could worsen from getting up, eating, closing the eyes, walking, sitting, yawning, or drinking wine. The sufferer that requires phosphorus experiences vertigo when rising from their seat. They also may experience faintness, staggering, and falling forward, and they may feel as if the room is elevated or floating. The symptoms often subside from open air, bowel movements, and lying down. Symptoms may worsen from sitting, looking down or up, turning, violent motion, exposure to a warm room, eating, drugs, or a loss of fluids. Some might feel worse during the evening as well. Stooping or lying with the head high may also improve symptoms. Ferrum metallicum is used for anemic vertigo that worsens when suddenly getting up from a lying or sitting position. It also occurs when going downhill or crossing a body of water. Lachesis is required when the person is stupefied and experiences a loss of consciousness, convulsions, tremors of the extremities, a blue face, and paralysis, especially of the left side. Symptoms may be due to frequent absent-mindedness, blowing expiration, a rush of blood to the head, mental emotions, or the use of liquors. 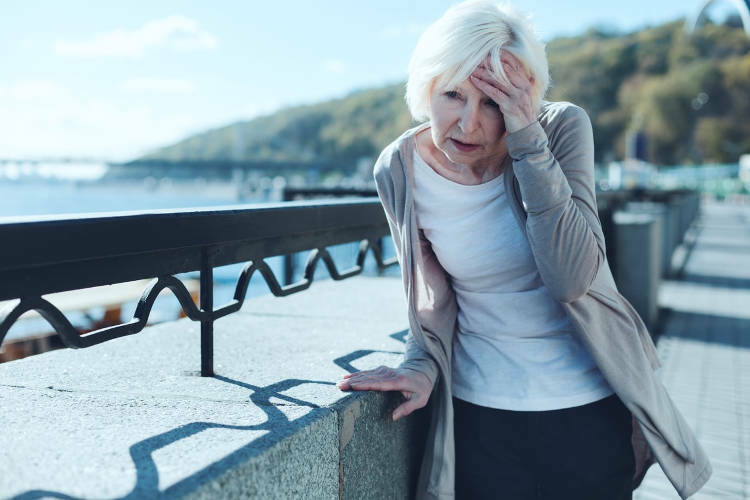 Rhus toxicodendron is useful for vertigo in the elderly, especially when it is triggered as soon as the patient rises from a sitting position. The remedy is needed for vertigo associated with heavy limbs, likely caused by senile changes in the brain. There are several other homeopathic remedies used for vertigo. For instance, homeopathic iodine is used for older people with chronic congestive vertigo. Borax is another remedy used in people who experience vertigo from tilting the head downward. Other homeopathic remedies used for vertigo include Argentum metallicum, Apis mellifica, belladonna, baptisia, Calcarea sulphuricum, lycopodium, gelsemium, dulcamara, digitalis, chelidonium, Cannabis indica, thuja, sabina, tabaccum, graphites, pulsatilla, sulfur, Natrum carbonica, Natrum muriaticum, Secale cornutum, and Kalium iodatum. There are some considerations for vertigo treatment. For instance, over-the-counter drugs can increase vertigo symptoms; these include aspirin, antacids, and non-steroidal anti-inflammatory drugs (NSAIDs). What are other vertigo prevention and treatment methods? Overall, it is best to develop a healthy lifestyle and reduce stress. But some other natural therapies for vertigo include cranial sacral therapy, acupuncture, hypnosis, guided imagery, and biofeedback. Regular light exercises can help you relax—especially yoga, meditation, tai chi, and qigong. Hershoff, A., N.D., Homeopathic Remedies: A Quick and Easy Guide to Common Disorders and Their Homeopathic Treatments (New York: Penguin Putnam Inc., 1999), 192-193, 284-285. Balch, J., et al., Prescription for Natural Cures: A Self-Care Guide for Treating Health Problems with Natural Remedies Including Diet, Nutrition, Supplements, and Other Holistic Methods (Hoboken: John Wiley & Sons, Inc., 2004), 154-159, 544-547. Samy, H.M., “Dizziness, Vertigo, and Imbalance</,” Medscape web site; http://emedicine.medscape.com/article/2149881-overview, last accessed April 7, 2015. “Vertigo: causes, symptoms and treatment,” Medical News Today; http://www.medicalnewstoday.com/articles/160900.php, last updated Feb. 12, 2015. “Does Diet Really Matter?” Vestibular Disorders Association web site; http://vestibular.org/understanding-vestibular-disorders/treatment/vestibular-diet, last accessed April 7, 2015. Issing, W., et al., “The homeopathic preparation Vertigoheel versus Ginkgo biloba in the treatment of vertigo in an elderly population: a double-blinded, randomized, controlled clinical trial,” Journal of Alternative and Complementary Medicine, February 2005; 11(1): 155-160. “11 Easy Home Remedies for the Treatment of Vertigo,” Home Remedy Shop web site, Nov. 22, 2013; http://www.homeremedyshop.com/11-easy-home-remedies-for-the-treatment-of-vertigo/. “My Experience with Vertigo, Cold Feet and Nausea,” Connective Tissue Disorder web site; http://www.ctds.info/vert-treat.html, last accessed April 7, 2015. Buki, B., et al., “Vitamin D deficiency and benign paroxysmal positioning vertigo,” Medical Hypotheses, Oct. 2014; 80(2): 201-204, doi: 10.1016/j.meny.2012.11.029. Sokolova, L., et al., “Treatment of Vertigo: A Randomized, Double-Blind Trial Comparing Efficacy and Safety of Ginkgo biloba Extract EGb 761 and Betahistine,” International Journal of Otolaryngology, June 25, 2014: 682439, doi: 10.1155/2014/682439.